And what if the reps in attendance vote no? And here are the old/present ones. Please take a moment, gentle readers, and compare them. You’ll find some interesting differences. This governance issue, he said, is to change bylaws so there are no longer membership organizations—he indicated that many are no longer active, and that the particular politics that brought them together aren’t relevant anymore. 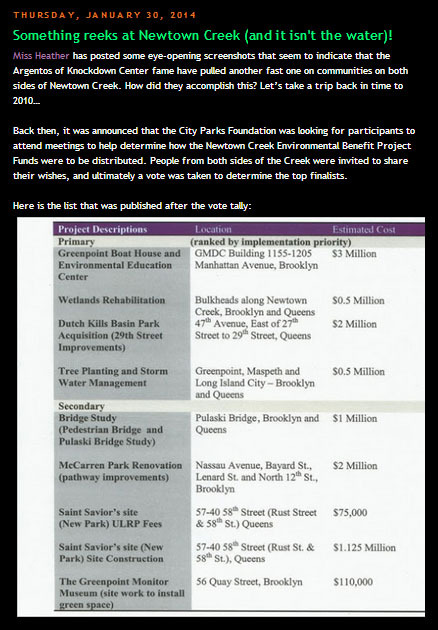 Rich Mazur, Executive Director of the North Brooklyn Development Corporation. Some of you might recall this organization is handling the dispersal of the $19,000,000 Exxon-Mobil settlement. 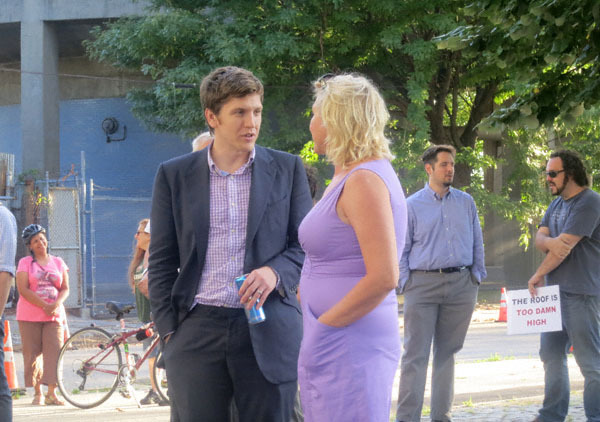 Barbara McGlamery, the wife of a board member of Open Space Alliance North Brooklyn: Adam Perlmutter. You can (and should) read the rest here. On a (somewhat) related note, it would appear there is a tax lien on 51 Ash Street. This is of course the location of the “new and improved” boat house. How/why does that sound familiar? Anyone? 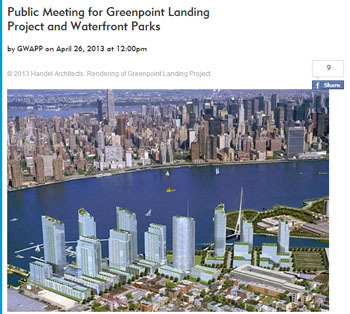 …So, how can the 40-story towers in Greenpoint be stopped? 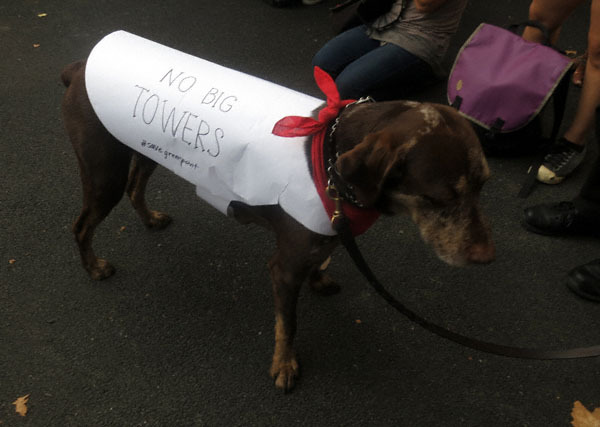 The only way to reduce the height and density of the 2005 rezoning is rezone the rezoning. But that is a process that would be extremely difficult assuming that you had a sympathetic administration, and would take years of committed community activism to achieve. A “dezoning” would be fighting against billions of dollars of vested development rights and the entrenched interests of labor unions and affordable housing advocates. These are exactly the forces that came together to make the 2005 rezoning happen in the first place (and others–Domino, for instance). Certainly with the right mayor in office, a waterfront zoning redo is not completely out of the question, but even in that perfect-world scenario, it is a huge lift. This handsome fellow was one of the many citizens who attended this evening’s convocation. 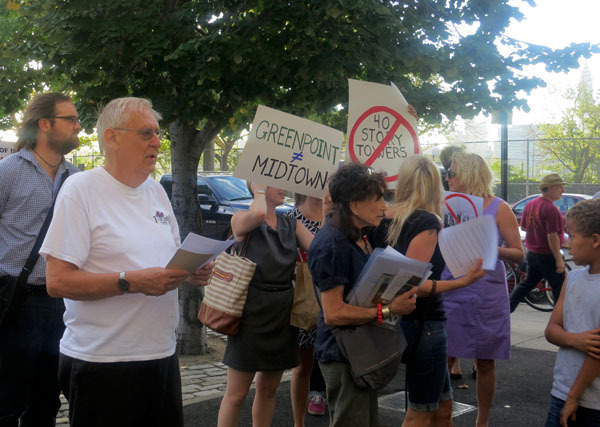 Not only am I pleased to announce that the turn out was great, but the community feedback was even better (and totally Greenpoint— which is not, as one attendee noted, “Midtown”). Without further ado, here we go! Starting at 6:36: This. MAN. RULES. 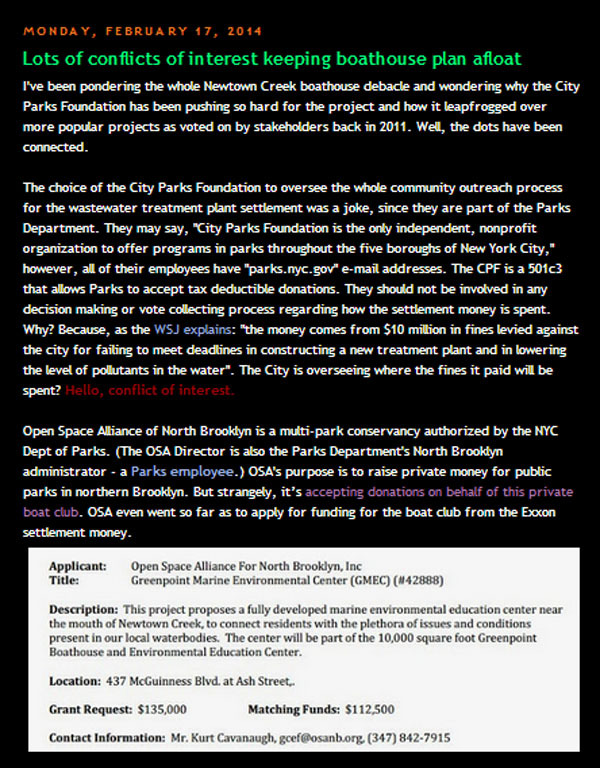 Those of you who wish to join the effort, should point and click your way to Save Greenpoint’s web site and sign up for their mailing list. In closing, I want to thank everyone who came out this evening— even those who did not speak out. Especially Adam Perlmutter, Esquire. but he also happened to be under the hire of George Klein (the fellow behind Greenpoint Landing) to state his case for the 2005 Rezone. 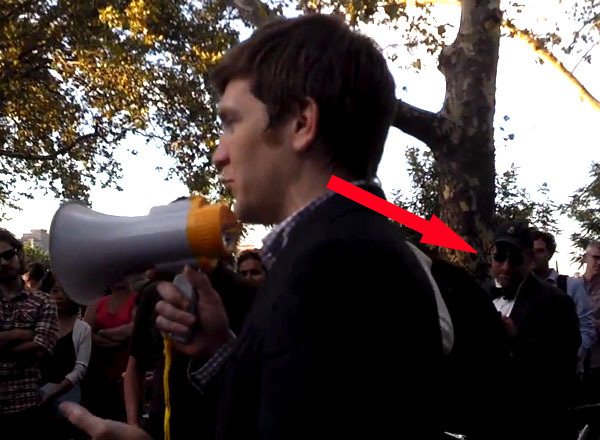 The latter is, when you really think about it, why this rally was conducted in the first place. Monday, May 6, 2013 starting at 6:30 p.m.